It felt like a Spring day. For the first time in a few months we had the doors open all day and didn’t feel the need to throw on extra clothing or turn the heaters on. Not quite the same today, but great to think that warmer weather is not too far away. Given the warmer weather, it seemed wrong to cook anything too heavy for dinner, so I thought a fresh light tart with salad would be perfect. Found this recipe for Taleggio Tart and although I wasn’t looking for vegetarian, I did like the walnut pastry idea. We are blessed with a very old walnut tree, which some years yields kilos of wonderful walnuts, and other years they seem to not quite do their thing. Luckily the last crop was great, so we have many walnuts to use. 100g cheese – we had grated Edam so I used that – but you could experiment here! To make the pastry add the flour and walnuts to a food processer. Whizz until the walnuts are well blended. Add the butter and whizz again until the mixture looks a bit crumbly. Lightly beat the egg and add with the water to the food processor and pulse until mixture forms a dough. If you need to, add more water, but in small amounts at a time. Take out of the food processor, cover with cling film and put in refrigerator for around 30 minutes. Turn on oven to around 200 Celsius. Take pastry and roll out to fit your dish – I used a 23cm square loose bottomed cake tin. Prick the bottom and put back in the fridge for about another 15 minutes. Line pastry with baking paper, fill with baking beans and put into preheated oven. Cook for about 15 minutes . Remove baking paper and beans put pastry back into oven for about another 10 minutes (to dry out the bottom before you place the filling into it). Reduce the oven to around 180 C.
While pastry is cooking heat oil in a pan and gently cook shallots, onions (if using) and garlic until softened and golden. Add bacon and other vegetables – except for spinach and cook for about another 8 minutes. Take off the heat and add parsley and spinach, mixing into the mixture so spinach is wilted. Lightly beat eggs and mix into cream. Add vegetable mixture and cheese. Add half of the lemon zest. Season. 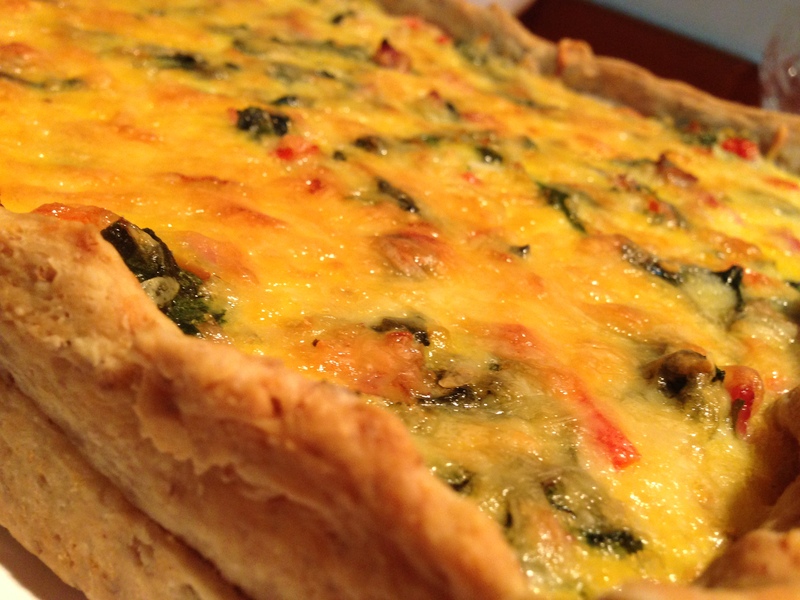 Pour mixture into prepared pastry case – you could add a little extra cheese as topping here. Cook for about 40 minutes in oven. Filling should be set and firm to the touch. Let cool slightly, then garnish with more parsley and rest of lemon zest. A tart like this is so versatile. The ingredients really can depend on what you have in store. No two should ever be the same!